They are called the Tombs of Giants or Tomba dei giganti in Italian. This name is given by local people and archaeologists to a type of Sardinian megalithic “gallery grave”. The megaliths are believed to have been built during the Bronze Age by the so-called Nuragic civilization. 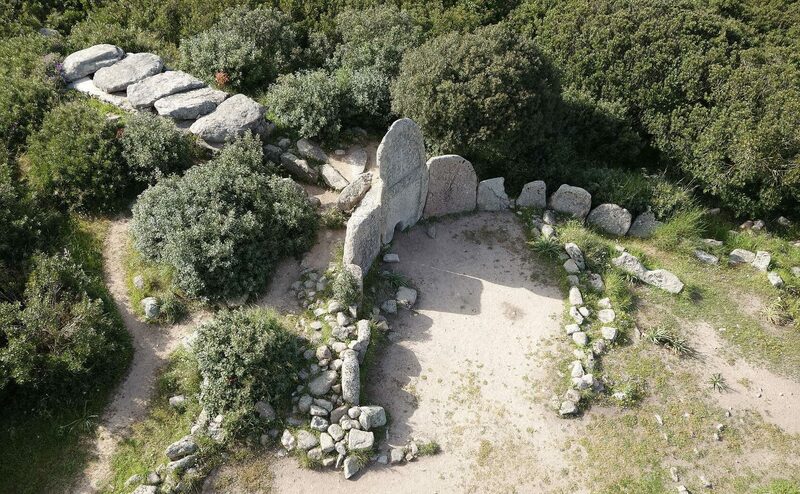 There are over 800 of these “tombs” that have been discovered on the island of Sardinia. It is said they are collective tombs yet there is not a single shred of evidence that they were actually tombs. Our research indicates that these megaliths are probably much older than previously believed. Fig. 1: This bird-eye view from a typical Giants’ Tomb shows how most of these megaliths are constructed. Their long and narrow passageways are roofed with large stone blocks (upper left). They also incorporate a half circle of standing stones and in the middle a large megalith with a small opening. The opening is just large enough for an average person to crawl through. This gives an indication of the sheer size of the stone blocks. Fig. 2: At the time Zedda performed his measurements with a magnetic compass, the magnetic pole was located at approximately 78N, 105W. What the name “Giants’ Tomb” suggests is that the megalithic monuments were built or used by giants in ancient times. But there is no evidence that this is indeed the case. Because the structures are large and they were believed to be used as tombs this name was an obvious choice for the Sardinians. We have researched the monuments by examining the database of Mauro Zedda of Isili, Sardinia. From 1994 up to 1996, Zedda and his team examined the orientation of 230 Giant Tombs over a period of ten years. We have provided their paper here. Instead of using True North by means of a theodolite, Zedda decided to use a nautical compass to establish North. His motivation to do so is described as “Tombe di Giganti are rarely, if ever, in so good a condition that something could be gained from the additional accuracy of a theodolite…”. There is, of course, some truth in this statement, but unfortunately he did not analyze the additional inaccuracy introduced by using a compass. Errors in these sorts of measurements build up according to ∑E = √(e12+e22+e32…en2) where e1 is the error of the compass, and e2 is the error of the alignments of the compass along the structure – e3 is the slight wandering of the magnetic pole during the course of Zedda’s research. In the case of Zedda’s research, the sum of errors (∑E) was just over ±2°. These are serious errors when they are not properly addressed. We corrected them in a fairly simple way by grouping the data around the larger peaks which is a mathematical way to deal with errors of measurements afterward. Fig. 3: Most of the Giants’ Tombs are similarly shaped. A long and narrow body that on the inside looks quite similar to the inside of Nuraghes. The round dish-shaped structure has a small entrance that, in most cases, is facing the South-east. In their paper, the researchers spent too many words to justify the use of a magnetic compass – almost as if they condoned using a basic simple tool for such a large undertaking, measuring the 230 monuments spread all across Sardinia. Using a theodolite does not only require more time, but it requires also much more expertise, an expertise that maybe was not present in his team. A compass is simple to use. But it is a fundamental mistake for such a large survey job that took so much time and effort. It is thought to be the only extensive data of the Giants Tombs available to date. But the data cannot be used as they are presented in Zedda’s paper because the team hasn’t done anything with the errors of the measurements. Fig. 4: We have proved with more than 590 ancient structures all over the world that a very long time ago there existed other ancient geographic poles. The foundations of these ancient structures relate to these poles with probabilities of over 99.99%. 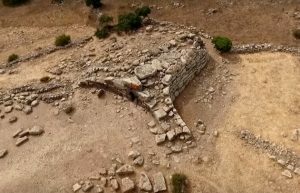 Because we have established this as a fact and not just as a theory, we have transformed our research into a reliable method to date other ancient monuments like Nuraghes and the Giants’ Tombs. Most of the ancient monuments are at least 50 times older than archaeologists want us to believe. | © Mario Buildreps 2015-2018. Fig. 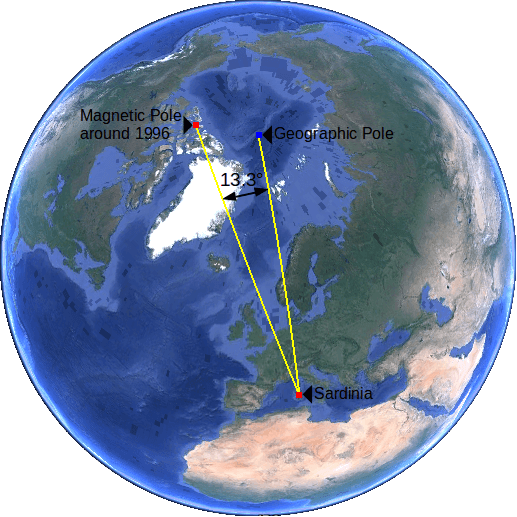 5: When we regard the position of the Magnetic Pole at the time when Zedda terminated his research in 1996, there appears to be a serious angle between the magnetic pole and true north. This angle is 13.3 degrees. The magnetic pole also wandered a little during the research. | © Mario Buildreps 2015-2018. Our method is all about True North and not about magnetic north. For astronomers, magnetic north has no real meaning, when the research is basically an astronomic one. It is well known that even the best compasses still result in reading errors of ±1°. This can become a big deal in large databases like ours. Furthermore, the magnetic pole moves around quite rapidly. 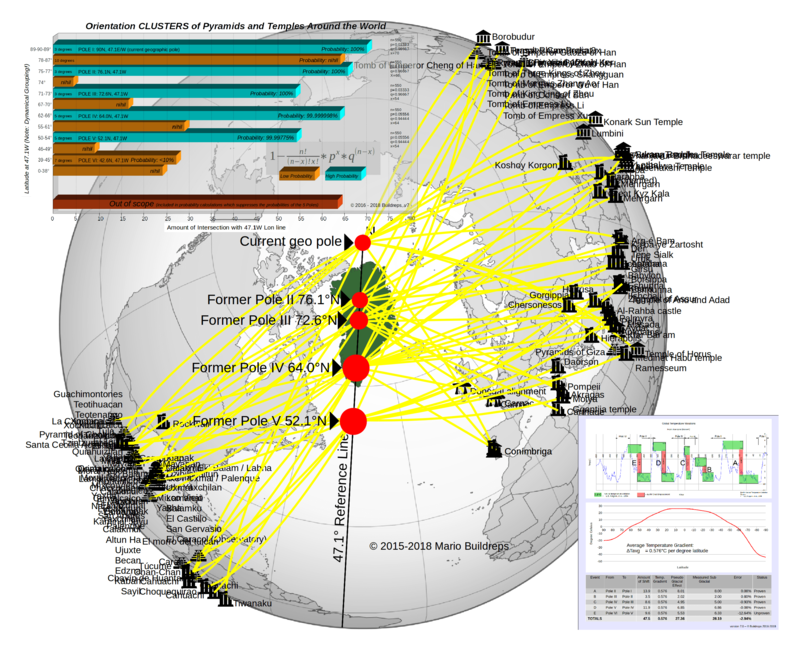 When a research extends over multiple years, the magnetic pole movement is an issue that has to be addressed. In Fig. 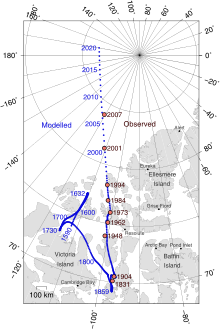 2 we show how the magnetic pole wandered over the years, and in Fig. 5 we show where the magnetic pole was located at the time that Zedda was concluding his research on the Giants’ Tombs in 1996. There is a serious deviation between both poles and this issue has to be addressed somehow as well. 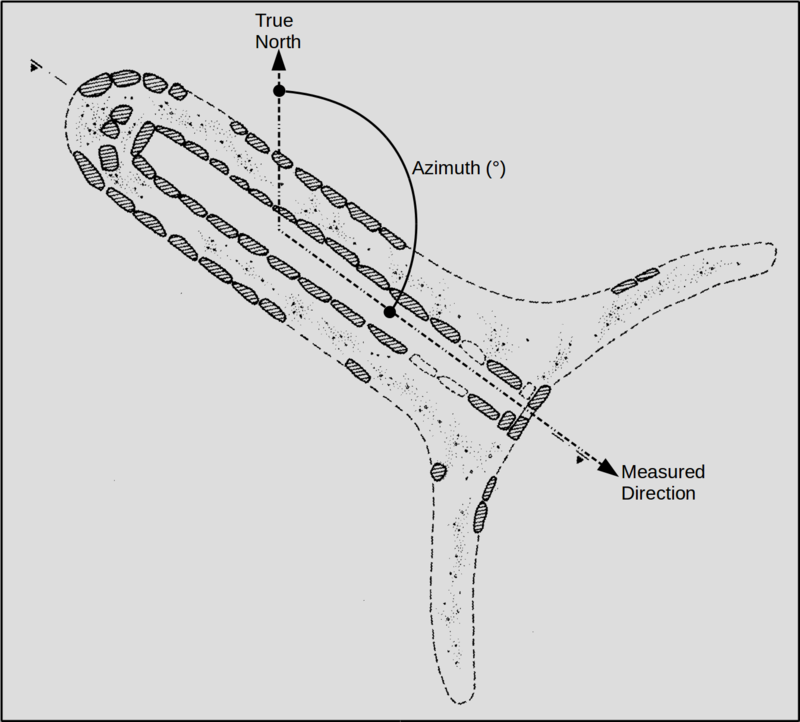 In the research led by Zedda, this issue is only mentioned as: “…our azimuths were derived from data obtained with a nautical compass that had been carefully checked for any error in construction.” Not a single word or calculation is spent on the issue that we show in Fig. 2 and Fig. 5. Therefore, we had to verify that this angle between the magnetic pole and geographic pole had been incorporated in the data. And indeed, this appeared to be the case. But what we discovered is that the errors of the measurements were sometimes quite large, ±2°. This is exactly the deviation that we expected with the combined errors of a nautical compass and the alignment of the compass along the monuments as we have described above. It is odd that the data in the paper that we mentioned above contains many measurements of up to ½°. This half degree has no value other than maybe to distract the reader into believing that the accuracy is unquestionable. That is why we have revalued the data of the paper into groups that are lined up with the errors of ±2°. Fig. 6: This graph shows the corrected data of Zedda’s paper of 1996. We have equalized the errors of the measurements by spreading the number of structures over a larger angle of orientation. The graph clearly shows a Gauss distribution with a massive peak at around 126°. The full range is limited to σ1 (95%). The outer anomalies are not included in the probability calculations. The red dashes show where the Poles I to VI are located. The locations of the Poles and the orientation patterns of the Giants’ Tombs show an excessively high correlation, especially at the peaks. | © Mario Buildreps 2015-2018. How are Many of the Giants’ Tombs Oriented? Fig. 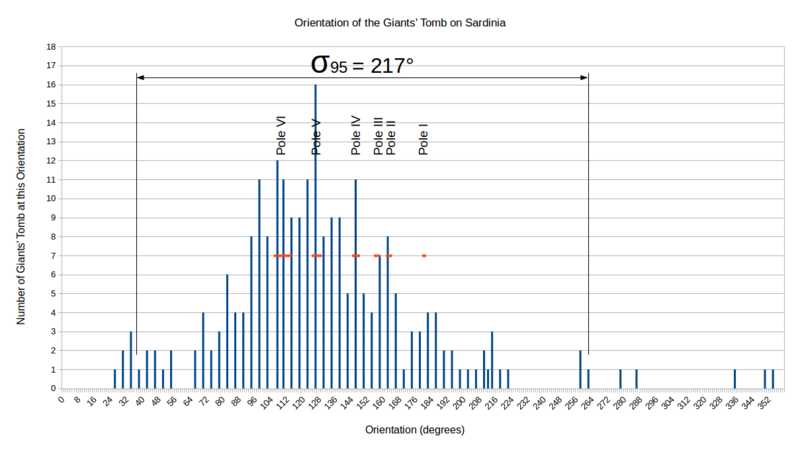 7: Here we show how many of the Giants’ Tombs are oriented. With their opening they are predominantly facing South-East and South-South-East. The largest spike is around 126 degrees and that correspond exactly with Pole V. | © Alberto Moravetti edited by Mario Buildreps et al. In Fig. 6 we show how the Giants’ Tombs are oriented. There is a clear Gaussian distribution visible and that means there is a pattern in the orientation of the megaliths. In the graph, we show with the red lines where the Poles I to VI are located. We see that the largest spike runs directly through Pole V. This peak is at an azimuth of 126° and points to the center of the proven Pole V.
Two other large spikes are running through the suspected location of Pole VI. We emphasize that Pole VI is still unproven. However, another large spike runs directly through Pole IV. The odds that these seemingly unrelated patterns would match coincidentally one over the other is quite small. We can calculate the probability that these two patterns actually belong together and what consequences this would have for the true age of these Giants’ Tombs. How Old Are the Giants’ Tombs? The odds that the large spike coincides with Pole V is 87.5%, which is not very spectacular. In this probability, the odds include that this spike could also be running through one of the other four Poles. But if we consider the total number of Giants’ Tombs that correspond with the proven Poles I to V, the odds are jumping through the roof. 20.36% of the Giants Tombs massively relate to an area of 11.24% which are the areas of the 5 proven Poles. There is a chance of only 1 to 19,478 that this configuration is coincidental. And that means that we can date the monuments within our defined time frames with a high degree of certainty. Fig. 8: Because the Giants’ Tombs were once cardinally oriented means that they were facing South. It could be possible that they were used as sundials. But that still does not explain the enormous elongated body that is pointing to the ancient North. | © Mario Buildreps 2015-2018. That means that these Giants’ Tombs were once cardinally oriented with their opening to the ancient South. The age of the megaliths extends over a period of more than 440,000 years. They are thus incredibly old. The dating done by archaeology is a ridiculous attempt to fake their own expertise. The way archaeology investigates an ancient site might appear impressive to a layman but, in fact, it has nothing to do with uncovering our ancient truth. We have discovered similar patterns with the Nuraghes. The Giants’ Tombs were first built on Sardinia, followed on a massive scale by simple Nuraghes (spike on Pole IV) and then followed by complex Nuraghes (spike on Pole III). That is how and why we know with high certainty that this civilization stretches out over a period of hundreds of thousands of years. 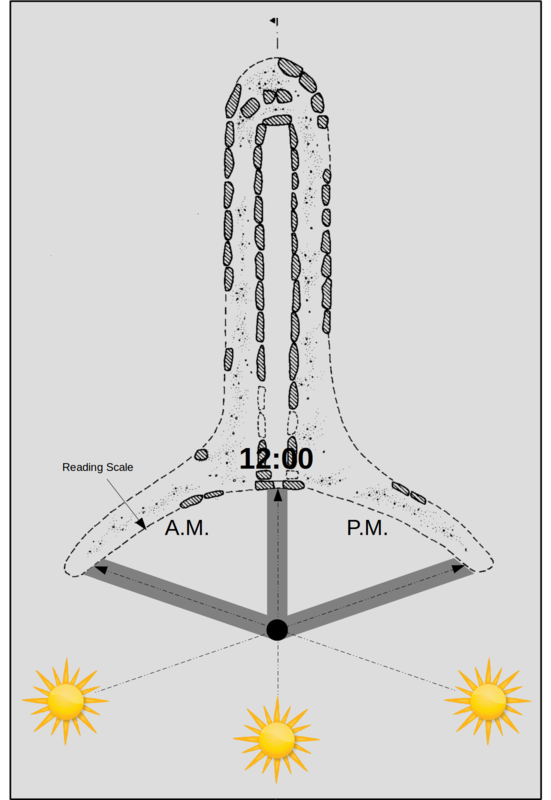 Despite our extensive research regarding the Giants’ Tombs, we are still not convinced that they were used as sundials, although that could have been the case. It seems that the megaliths had more than only this purpose, based upon the large elongated body that pointed to an ancient True North. We have discovered that complex Nuraghes were used to determine the solstices in ancient times. We also discovered that complex Nuraghes were used to study sky phenomena such as the movements of the Moon. We have discovered how Pozzo di Santa Cristina was used. However, none of these ancient megaliths are part of our extensive database that references ancient structures from all over the world, and yet, they correlate with very high probabilities. The monuments on Sardinia show a clear increase in sophistication in relation to their orientation. In other words, the younger the structures, the more complex and sophisticated they became. Humanity seems to have developed following a much longer time frame than archaeology wants us to believe. Over many thousands of years, the ancient builder races increased their ability to measure the seasons and time of day. The probability that this pattern alone is something coincidental is less than 0.4%. If we include all the other patterns that we have discovered, there is a probability of more than 99.999% that we are correct in our conclusions. That is an immense discovery that instantly corrects the evolution of Homo sapiens. But to understand the full consequences will take many more years to come. Therefore, it seems likely that the Giants’ Tombs were used as a sort of time/calendar instrument and we are still debating their true purpose. The discovery that these megaliths were once cardinally oriented, each in their own timeframe, is a major discovery that makes it easier to research their purpose in ancient times. If we make new discoveries regarding the purpose of the Giants’ Tombs, we will update this article. © 2015 – 2018 by Mario Buildreps et al.